Editify is an app that allows you to make edits to orders in your online store. It also makes the editing very easy and saves you both time and effort compared to doing manual modifications for all the orders your online store has. What exactly happens when I edit an order? 1. A new order is created. This new order is a duplicate of the original order but it contains all the latest details you had entered when you modify the order. 2. The original order is canceled. 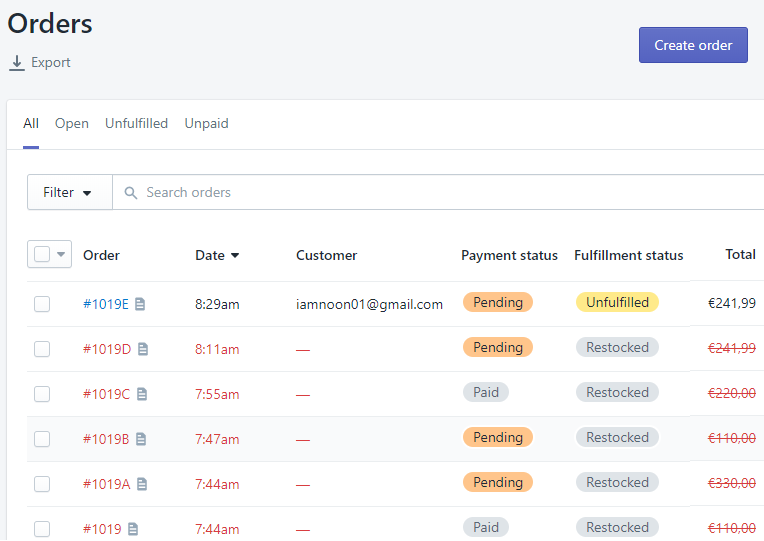 Regardless of how many times you edited an order, all those previous orders will be canceled and only the latest order which contains all the updated information will be retained and considered active. When you go back to the Orders page, you can still see all the previous versions of the order but they will be in red and marked as Restocked. This cancellation setting is optional but recommended as it properly monitors stocks and returns them if needed, as well as refunds any excess funds, as necessary.